Chalet Alice Velut - Now managed by 'Self Catered - Saint Martin' in the 3 Valleys! Chalet Alice Velut consists of five apartments. Four 2-bedroom apartments on the ground and first floor and one spacious 3-bedroom penthouse apartment which takes up the whole of the second floor. The apartments are ideal to be booked together by several families / groups of friends that want to be close to each other but also prefer their own kitchen and living facilities. All the apartments are bright, spacious and tastefully decorated! They all have real log fires and balconies with village and mountain views. The higher you are in the building the better the views! Chalet Alice Velut’s location is in the centre of the village, next to the church and tourist office and above the well-known craft beer and wine bar “Pourquoi Pas”. 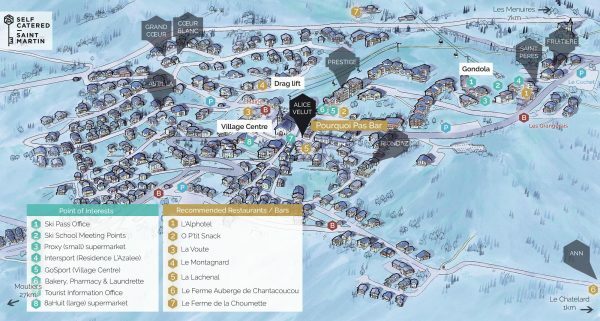 The closest ski lift and slopes are within less than 50 meters from the front door of the chalet – All necessary resort facilities are located on your doorstep! A fantastic (near enough) ski-in ski-out location!